IMPORTANT: See thread below with regards to the 'missing landscape' problem, which affects both this and the original Qarl's Landscape. This has now been changed to work with Better Cities 6.0. It is still, however, compatible with 5.5.3 and vanilla. In the event, very few changes were needed. But I've only been looking at fruit trees. It may be that Qarl's original logs need an overhaul to work with other mods, but that's for another day. 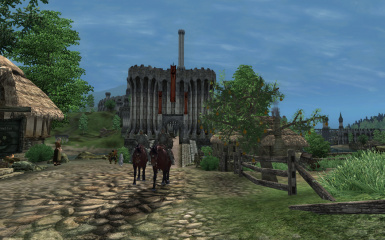 Back to Oblivion and of course had to re-install your mod. Quick question - is there a re-texture for the tree bark? They look great and it's oddly pleasing to pick them! I wish we could plant our own trees, or are the trees too complicated for that to be possible? Hey tegeus! Great work on this mod. Still waiting for the logs to be made compatible with UL. Kidding, well mostly, I know that is a lot of work. I have been having an issue in my game through that has caused me to uninstall Qarls Harvest for the time being and unfortunately your mod as well. The problem is that I was getting gaping square/rectangular holes in the landscape where the cells were not loading. Happening most often outside Bravil near the stables, outside of Skingrad near the stables, outside of the Inn of Ill Omen and outside of Charcoal Cave, plus one or two other spots. After a couple weeks of pondering what could be causing the issue and some diligent internet research, I discovered that there is an engine bug that causes cells not to load if misc items get knocked from one cell to the other. When the cell where the items got knocked into loads, the game sees the items were from another cell and thinks the adjacent cell where the items came from is already loaded. This causes the adjacent cell not to load when you move toward it, leaving cell sized holes gaping in your landscape. This engine bug was first documented here in this thread, along with links to photos of what the problem looks like in game. Qarls Harvest adds many apple trees that can drop apples that can roll into adjacent cells, and then the engine bug takes over and causes these gaping holes in the land. The only solution I can think of (apart from fixing the engine) is to remove the trees that are located in areas where apples (or other fruit items) can roll downhill into adjacent cells. If the trees are located only in areas that slope up on all sides or inside walled cities where the entire city loads at once, it should not be a problem. But trees like the one just south of the charcoal cave entrance that is located at the top of a very long hill can drop apples that roll for a country mile and cause these gaping holes to appear when you are travelling up the road. Not sure if you are still working on this mod or not, but I thought I'd point it out in case you wanted to fix this problem in Qarls Harvest. The specific trees that were causing me problems seemed to come mostly from Qarls Harvest rather than More Harvestable Fruits. Oh, wow! Been away from modding for a while, so I missed this post. Thank you, Acerac, for this, it was driving me mad after I made this mod. Although most of the issues I could see were with the original trees, just as you say, which was baffling. What I will do is take a look at this mod and check the tree placements according to local contours, as you have suggested. Should no longer be an issue thanks to Acerac & Tiawar's EngineBugFixes. Tsk. I should have known of that. (Oh, it's only from last month.) Thanks, RM. OTOH, quite a lot of people will not get round to installing that, so it might be an idea to see if the most blatant examples can be fixed (easily). EDIT. Sod that. I'm just going to add EngineBugFixes to the file requirement, and the sticky. Not much I can do for the original page, though. Plus, that way more people will reaping the benefits of EngineBugFixes. It's always one I recommend when I troubleshoot. Hi - firstly..I love your fruit additions! I was wondering if it was normal to have so much "dropped" fruit lying around? In Anvil, for example, my tree has littered the ground with apples right in front of the gate, and I often find fruit floating around in the rivers / lakes. Dropped fruit is an issue, yes. I should have specified a Clean Save, which may help. The Anvil case, for example, is one of the original trees which has been moved to work with the latest Better Cities, so it's not down to mesh changes by me (I was worried about the pears mostly). I think that, when it's first loaded, the fruit from the original tree position just gets dumped on the floor. This certainly happens with the moved tree from the Chorrol castle courtyard. It kind of surprised me, and I don't fully understand it (these are not persistent objects after all). The problems should settle down when the cell resets, but there will still be issues with, for example, NPCs and creatures bumping into trees. This was true in the original, it's just rather more apparent with more trees. I've tried to keep the trees away from the path grid - one of the reasons I've positioned them carefully relative to other popular mods - but sometimes it's a tight squeeze. At some point in the future, I hope to patch the original Qarl's logs to work with Unique Landscapes and certain other mods where possible (some are buried), and this will most definitely need a Clean Save to work, they are persistent. So I started a new game and chose Anvil to start. The cherry tree just beside the temple is perfect. The apples outside the gate near the stable - Perfect! The tree right behind the Preacher looks like an orchard at the end of season. hahahaha!! I'll watch to see if it all resets at some point. Next question please...are you planning on fully redoing the original mod? The reason I'm asking is because the Official Oblivion Patch seems to override many of the "horse" items - feeding, loot, meat. And some folks - like me - don't necessarily use the horses. It would be fabulous to have the whole horse business as a separate option. Something like what Harvest Overhaul does in Skyrim...flora (trees / logs / hay bales etc. ) and then a unique option for creatures. 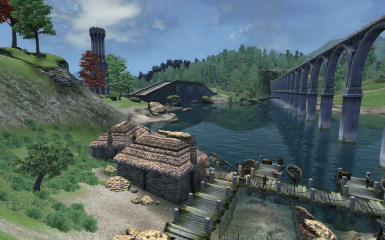 I love Oblivion so much, and your additions have made the trees so great...and I'm so excited to see how you expand this. Thank you again for your time and efforts. Well, I hadn't put much thought to the horse additions, hadn't really even noticed the UOP issue. But I would like to look at everything in the mod, so will check it eventually. (In fact, that should be easier than the log business - there are a *lot* of those.) There is also the issue of harvestable planters. Now I expect most of those to be OK, but there are plenty of popular mods that change interiors that may affect them. Oh, and I'm glad the clean save advice worked, will add that to the readme. Please let me know if you see any other problems, I do appreciate the input. Yes, I noticed the TES issue when I loaded Qarl's. It spams the hell out of the logging. Also, not sure if you're aware but LOOT wants the original mod to be cleaned because of 105 (I think that was how many) dirty edits. I went ahead and cleaned it. I'm not certain if that was the correct thing to do since there was no indication not to. And, while you're looking at things...Gottshaw village has a tree that could use relocation. Folks like to bump into it and send the fruit flying around. Will report back as I find more things amiss. BTW - love the raspberry bushes. New food items are always appreciated! Thanks...oh and on your buggy list....the pear tree outside the Wawnet Inn (in the fisherman's yard) holds all its fruit until you enter the Inn...once you exit..everything drops from the tree simultaneously...it was the funniest thing I've ever seen. Strange, I noticed exactly the same thing the other day, wrote it off as a one-off. Can't account for it, but added to list anyway, thanks. 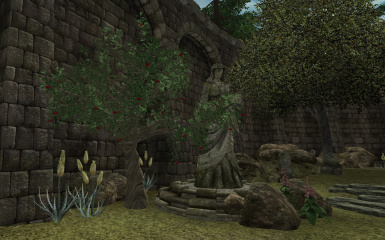 Hello, back to Oblivion and wondering if you'd had a chance to visit the fruit dropper tree in Weye? Just back myself after a long break, funny how one always comes back to OB sooner or later, eh? I'm just reviewing stuff slowly, but I remember that I found another big reason for the fruit drops is if you emerge from a load door in the same cell (at Weye, it's the inn door, but I have this in a few other places). Yes, it's weird, and I don't know why it should do that. Great mod. Adds a LOT of fruit. I really love this mod! I have just one question/request: is it possible to make the harvestable fruit respawning? There are a lot of empty trees all over the place after 600+ game days. Sorry for late reply, have been away from OB for a bit, will be looking at this mod again shortly. Are you sure you need a patch, as such? You could likely create a provisional dependency (as COBL Item Interchange does). Then yours could use resources from either my mod or Qarl's alone - but your mod would still work without them. Having said that, I'm not actually sure how exactly this is done, simply that it can be done - oh, and I think that it absolutely requires Wrye Bash. I'll check this thing about provisional dependency. I new esp, esm, esmified esp and so on, but I never checked this provisional depenency. It seems pretty interesting. Still I don't like to make my mod depending on Wrye Bash. 'Item Interchange Mode is a 'hack' (a horribly inelegant and inconsistent implementation of a feature that nonetheless works) to support Vacuity's Item Interchange mod. Anyway, you could also make a version that depends on my mod directly and one that doesn't, or you could just use the resources directly. But I can't speak for Qarl's stuff - the tree meshes, basically, you'd need to keep a dependency for those. • Do not activate this mod! It can ONLY be used by merging it into the Bashed Patch! • Missing Masters: Most likely this mod has masters that are not available on your machine. As a result activating it results in a "Missing Masters" problem which will cause Oblivion to crash immediately on startup. • Adds foods from a number of mods to the Cobl Dinner Plate. Hence it is only useful if you're using a using a Cobl aware hunger mod. In addition, it will not function unless you also have OBSE 15 (or higher) installed and active. WRT to COBL, I'm not sure. Maybe you could integrate it but add your own features via scripting? I'm pretty sure it doesn't add any qualities beyond what's in the game database, though - price, weight ... is it food or not etc? I'm no expert on survival mods, though. We'll talk about my mod another time. Just now I'm classifying fruits as ingredients who has the first power as Restore Magicka or Fortify Magicka and are flagged as Food. In addition there's a function, but that one is a little complex. Do you think it can work? Ah, I see. Yes, that's probably the only way you could distinguish between particular foodgroups. But you have to make sure your effects are not overridden, not just by a simple ingredient mod like mine, but by the contents of the Bashed Patch (if one is present). So COBL would likely work against you here. Best thing to do, I think, is specify that your mod must be loaded after the Bashed Patch to work properly. Or very late in the load order if the user is not running WB. To tell the truth I use a Leveled list to define food types (and subtypes). And I'll add a function to call from other mods to do that. All Oblivion and SI Ingredients are managet through that list. If something is not in the list, I use the first effect to define what they do. Still I need modders to be aware of it. Ha, well not the only way then, I stand corrected. (I'm still a learner driver, really.) This sounds ingenious and I'm really looking forward to seeing how it works. I'll likely retain the effects that my ingredients have (more or less), for the obvious reason that Restore/Fortify Magicka are rather too useful *first* effects when you're adding hundreds of respawning ingredients to the landscape (seasonal, admittedly). Anyway, please let me know when you publish, and if I can help with compatibility, I'll see what I can do. Oh, and I don't mind if effects are overridden by your mod, but OTOH that would only happen if it were directly dependent, which I shouldn't think advisable. You pointed a very serious issue. In fact I was so eger to find a solution that could permit people to add their food without being dependat to my mod that I completely overlooked that one! If I open a topic in one of the forum, will you partecipate to see if we can come up with a better distribution? Just to avoid spamming your mod with matters related to other mods. Naturally, I'm happy to chime in. I do have to say that, even with my limited knowledge, interactions between two or more mods do seem to cause some really knotty problems. I posted on Nexus forum. If you want take a look, here it is. It's one of the features of Nexus. You need to login in the chat/forum/Message to read the forum. I think the account is the same 'though. Same password too. Not sure. did you post that topic in the mod authors forums? I think you need a high number of unique downloads in at least one file to be able to view it even if you are logged on. Yes, I posted there. I didn't know that a certain number of DLs was required. Gotta say, I never thought I would enjoy a simple addition of fruit trees as much as I have. This is a great addition to Qarl's original work. I have, however, found a minor clash with Arthmoor's Molapi; the orange tree added in (by Qarl's, I assume) is floating in the air slightly. It's also a bit too close to the village well for comfort. I'd be more than happy to supply images if needed. I'd suggest either moving it slightly (though, I admit I'm not sure where) or removing it outright; there's another orange tree nearby, so it wouldn't be too much of a loss. Thank you very much, there is more content to come, hopefully with new seasonal effects too. But still working up meshes (not easy at this time of year, I'm more likely to be consuming stuff than simulating it). Thanks for the heads up on Molapi, yes, that should be cleaned up - this is an issue with the original as you say. A simple fix for the next update. I also have a QH patches collection out, so will likely place the fix in that too. Now fixed, though it's a tight squeeze largely because of the pathgridding. Sounds good to me. Here I was wondering whether your handful of trees can be safely planted across Cyrodiill, but I surely haven't expected farms, fertilizer plants, or a chain of cornershops. Let it be. I know it's just as exciting to you to wait and see what happens. This is how gems are born. Well, apart from the production infrastructure improvements, I was just thinking enhanced retail and wholesale opportunities, commodity speculation, price inflation management leading to tighter control of the money supply etc etc. And a few more legions to wave at them should they impose unfair tariffs. (Ours, of course, being merely a fair return to cover fixed overheads such as wear and tear on port facilities and so on). And a really big navy.